I hadn’t been to a Dave & Buster’s in years, but I was recently invited to swing on by and to check it out again. 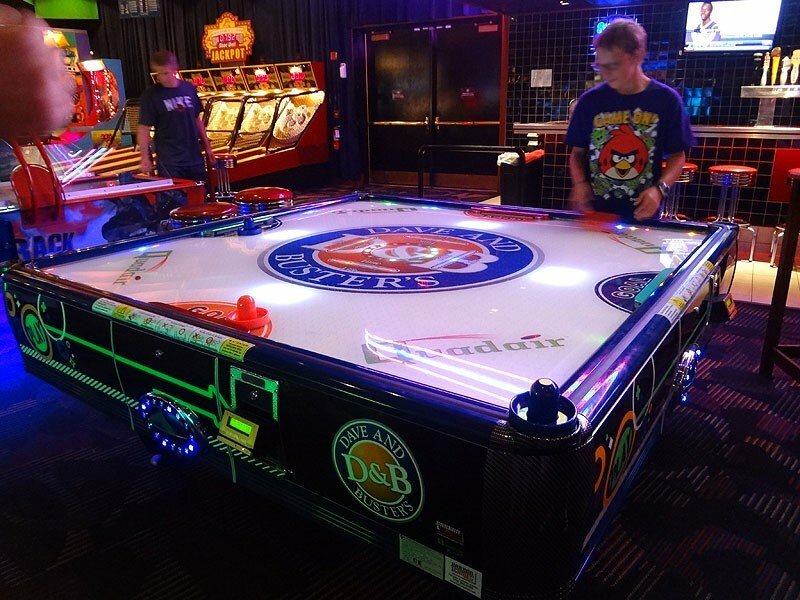 I was looking forward to taking Jake, Chris and T for a night out to try out Dave & Buster’s newest menu items and to try out some of their fun, new games this summer! Let’s get crackin’. There’s a lot of food to cover. Looking at all of these photos makes me feel the fullness again. Oof. We were greeted by some of the assistant managers who took very good care of us that evening. He had everything under control – ordering the food and drinks for us, asking if there was anything else we wanted and catering to our needs. I wish I could dine like this all of the time. Totally, totally spoiled. Oy. We started the dinner off with a salad – a salad unlike any other I have seen before. They call it the “Lawnmower Salad” and it comes on a huge plate with all of the veggies and greens layered out in pretty little rows. The nice part about this is you get to kind of build the salad the way you want it – grabbing the veggies you like and scooping them onto your own plate. The lettuces are underneath all of the toppings, so as you grab some, you also get the lettuce underneath. By the time you scoop what you want onto your own little plate, it manages to get all tossed and mixed up and ready for your waiting mouth… don’t read into that. 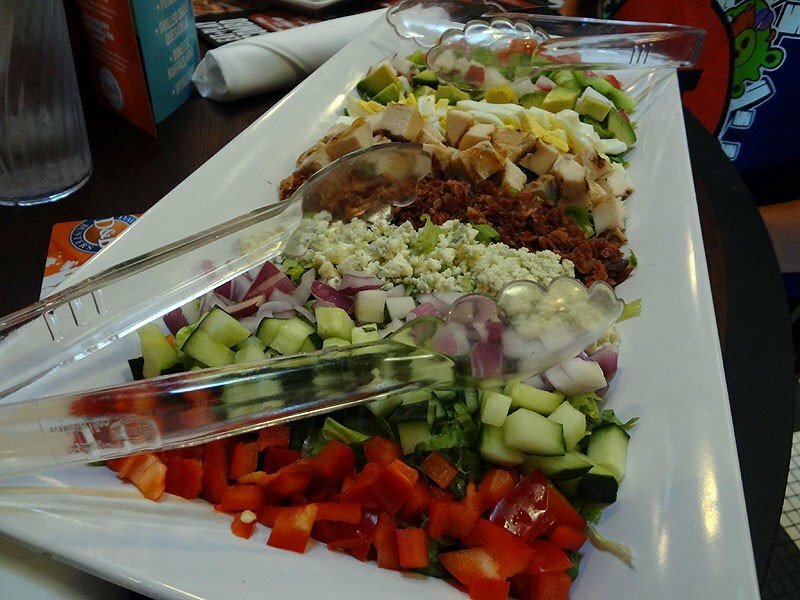 You get your choice of dressing on the side to pour over your own mini salad. Perfect for sharing with a crowd! Next we had the “5:15” appetizer platter brought out to us – this is geared towards the “after work” crowd who’s ready to get the evening started after a long day at work. 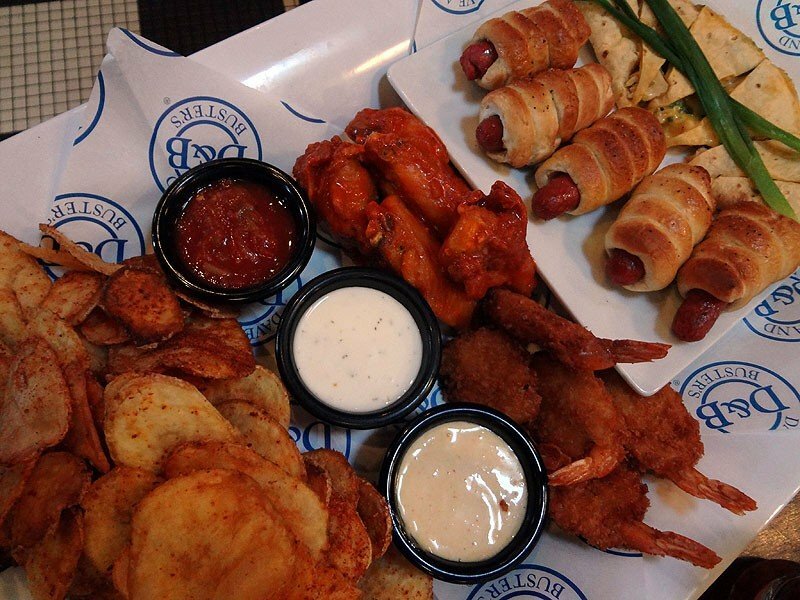 It comes with a little mix of everything – wings, quesadilla wedges, pretzel dogs, fried shrimp and plenty of freshly made BBQ potato chips. I got to eat all of the shrimp, because boys are weird. Well, at least the ones I know are. 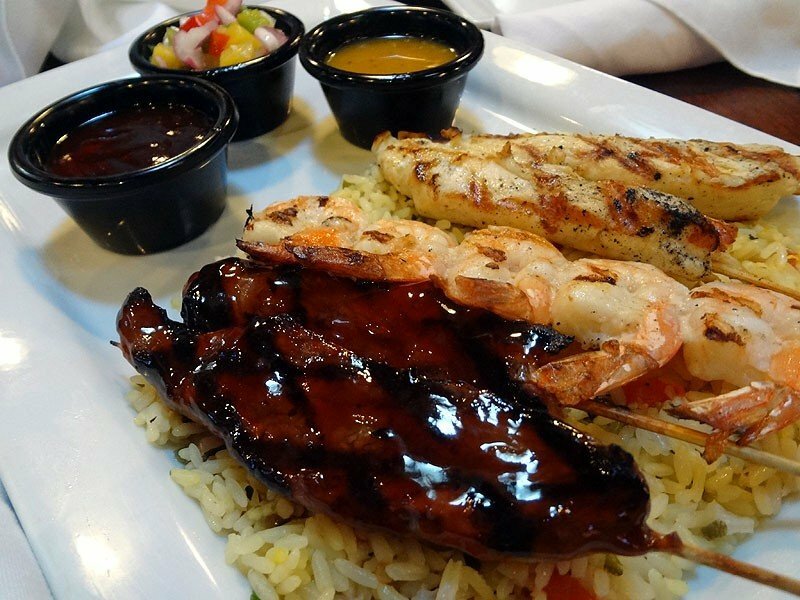 Who cares though – more shrimp for ME! The shrimp is a basic fried shrimp, but the spicy habanero sauce gives it a hefty kick to the seat of your pants, if you like that kind of thing. The pretzel dogs were my next favorite item – they were encased in a soft pretzel dough which paired nicely with the dogs. The boys were all seriously digging the potato chips which had Dave & Buster’s own BBQ seasoning dusted over all of the chips. They had a good crunch and flavor – though not my favorite, simply because I don’t dig BBQ chips all that much. Maybe I’m just a weird girl. Quesadilla wedges are nothing to write home about, but it rounds it out for a nice, plentiful appetizer. 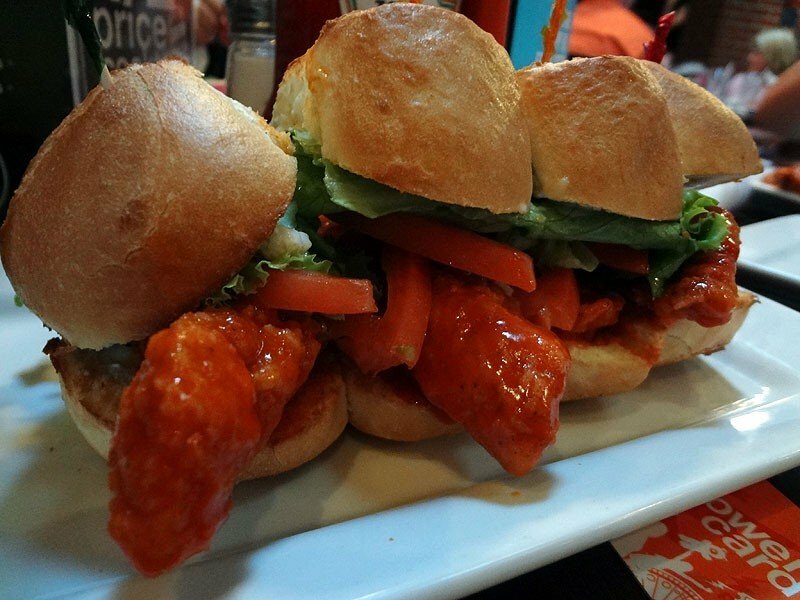 Jake ordered this extra item – these little buffalo chicken sandwiches. I had one little bite before I gave up – they were really too spicy for me. 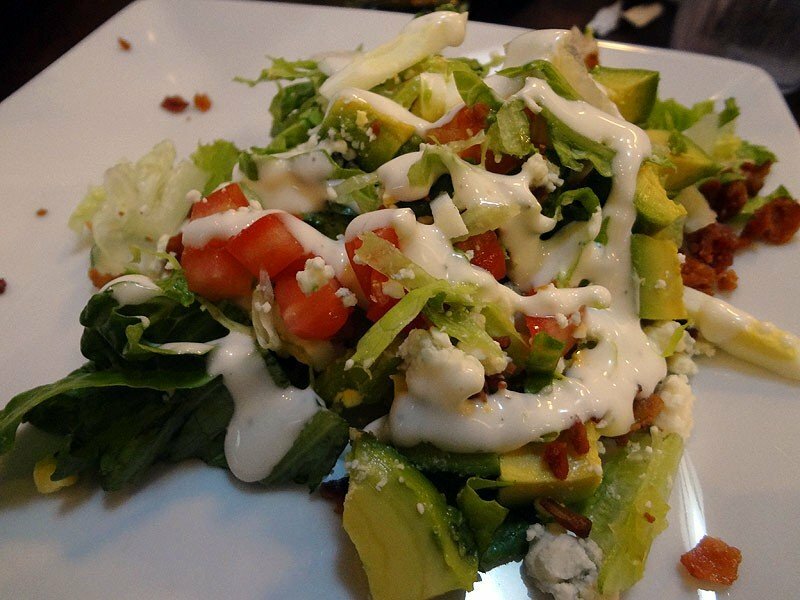 I couldn’t really taste the bleu cheese dressing at all – otherwise I might have eaten a little more. Jake and the boys seemed to enjoy these as well though. Similar to the buffalo wings but using chicken tenders instead. Look at this crazy drink! It’s called a Snow Cone (DeKuyper® Watermelon Pucker®, Malibu® Coconut rum, Three Olives® Cherry vodka, Blue Curaçao and a splash of Sprite®.) I totally loved the colors of the Snow Cone – I haven’t seen anything else quite like it. It’s got a good, powerful watermelon punch to it and it tasted pretty sweet – dangerous! I prefered the Jameson Shake myself – which tasted very much like a spiked chocolate milkshake. Delicious and also very dangerous as the alcohol taste is pretty lost in the mix. 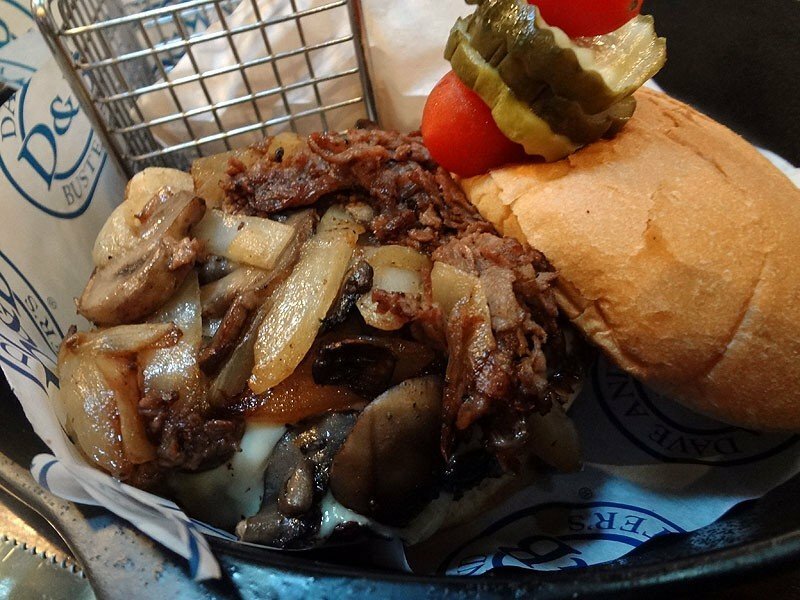 This is one of the new burgers that Dave & Buster’s is featuring this summer on their menu – the Black & Bleu burger. 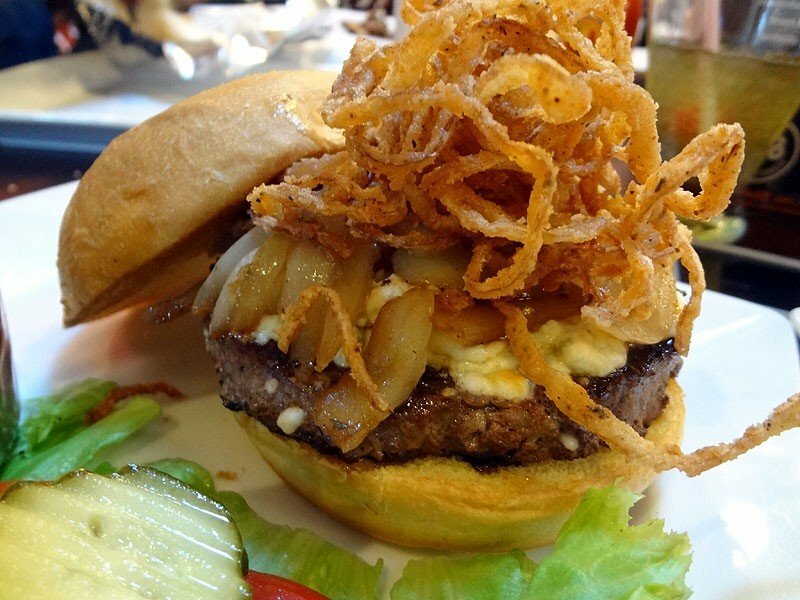 It’s got two types of onions on it, so I hope your date is also eating a lot of onions. Or, that you both just don’t care. I’m always in the latter – don’t care! Jake will kiss me anyway. I know, cause I’ve tried it! This was a decent burger – I wasn’t really blown away by it but it had a good flavor – maybe a little too much blue (bleu?) cheese. I like blue cheese but I don’t like a ton of it. I also prefer eating blue cheese with honeycomb and bread. Is that just me? The other featured burger is the South Philly Burger – this one was my favorite of the two new burgers. There were no peppers on the burger that I could see (rejoice!) and the thinly sliced steak on top was just really good. With the melted American cheese and the mess of onions and mushrooms, I was kind of in love. I didn’t eat much of it though since we were all sharing it – and well, because, I was already getting pretty full at this point. I think that shows something that I still loved it even when I was reaching my food limit capacity. One of the boys ordered this – I think we all had no concept of just how much food we were getting brought out to us. I made my own little taco with it, but I was very unimpressed. 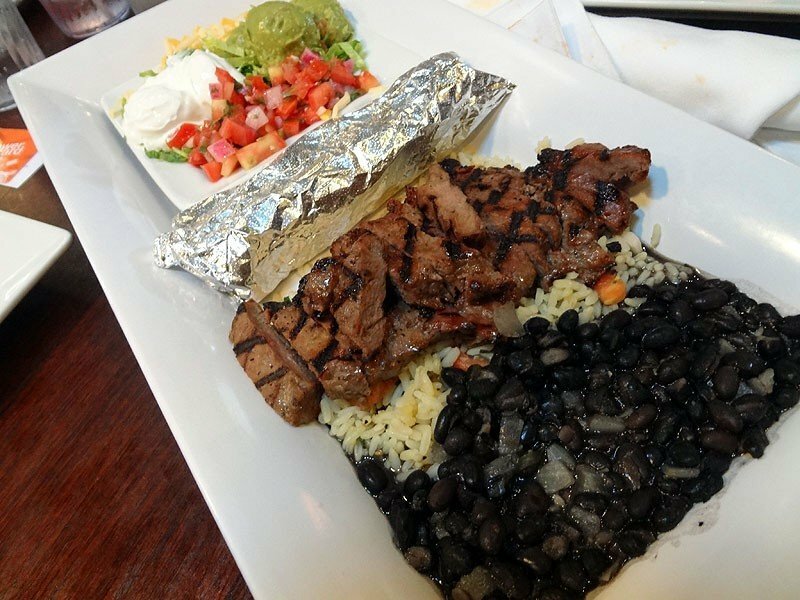 The steak didn’t have a ton of flavor and the tortillas were cold. I think there are too many good Mexican options in San Diego to make this a good choice. This was another item brought out to us for sharing. I didn’t really want to eat anymore at this point, but I did eat some of the shrimp just to try it. It was decent. The steak and chicken were just okay to me – but this could have been my full stomach rejecting food that these items didn’t really wow me. 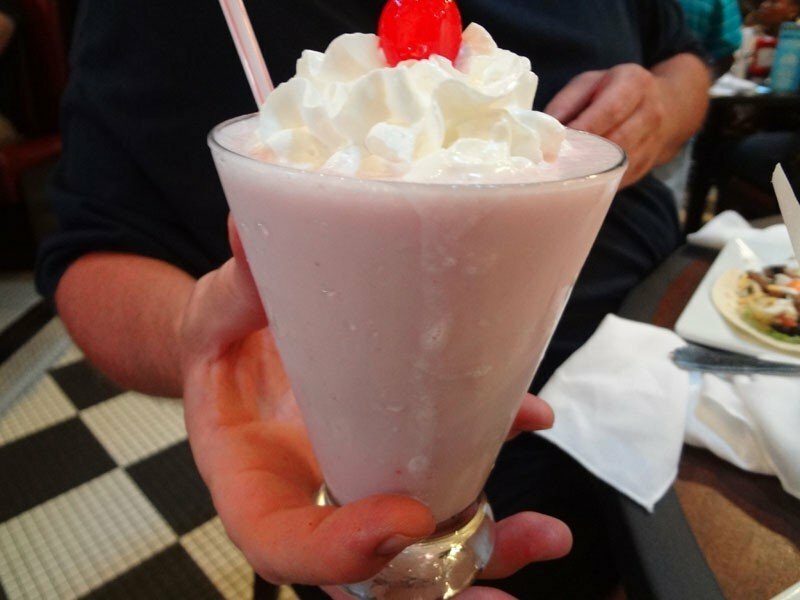 A strawberry shake. At least, I’m assuming this is only a strawberry shake and nothing more. Jake ordered this and I don’t remember it, really. I think I was slipping into a food coma at this point. Okay, I lamented about how full I was. But there’s dessert! 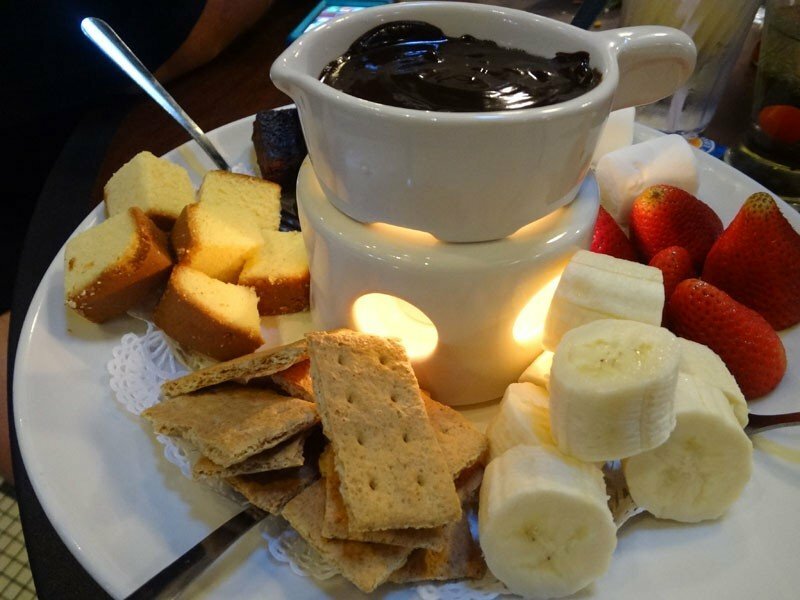 A little chocolate fondue is a nice way to round things out and is a good item to share with people. I didn’t feel quite as bad only eating a couple of items dipped in chocolate. Decent chocolate – it was a semisweet chocolate. It comes with a little candle to keep it warm. Cute! 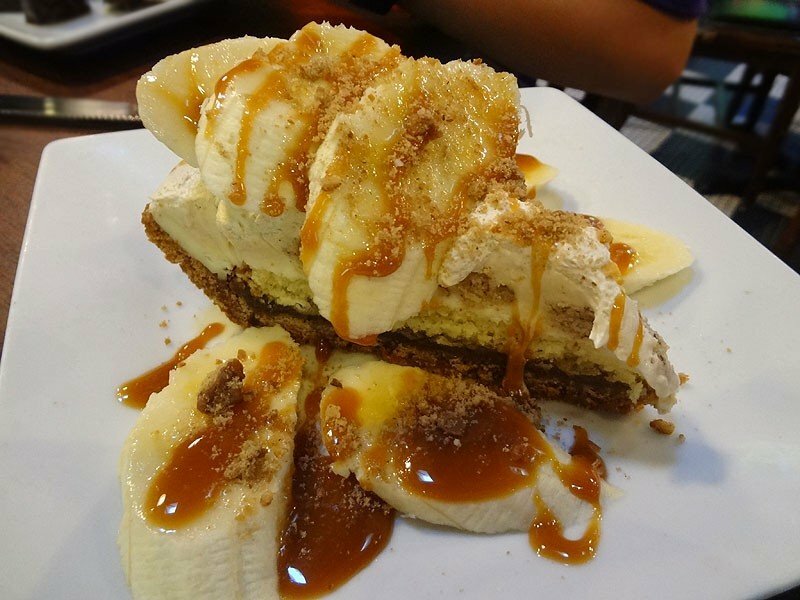 T. ordered this one – the Bananas Foster Pie. I would have never ordered this, since me and bananas are not very good friends. But I had a little bit of the pudding and cake part and it was pretty good. A bit sweet, but a unique and tasty dessert nonetheless. The caramel and rum sauce really tie in the “bananas foster” flavor into the pie. After stuffing ourselves silly and putting the leftovers in the car, it was time to try out some games! I played a big variety of stuff – shooting games, ticket games, driving games and the like. These are just some of the highlights! 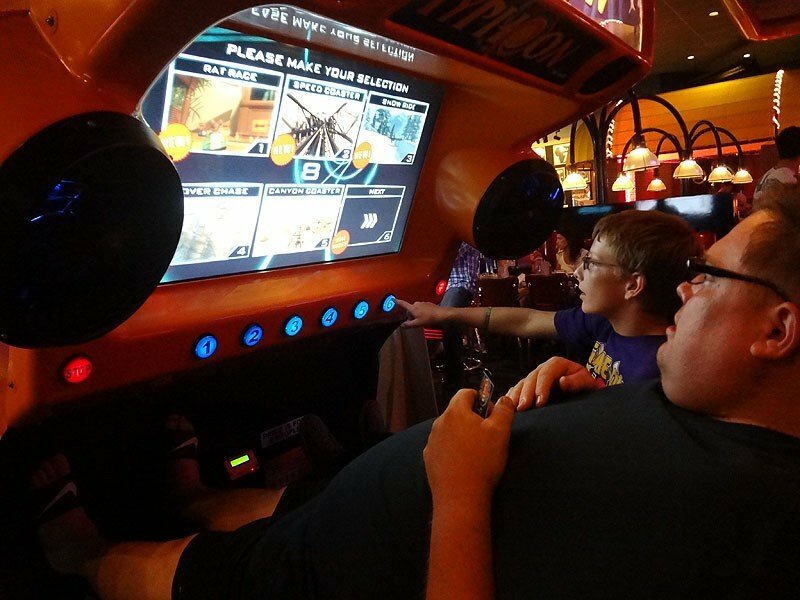 We had another person at Dave & Buster’s show us around the floor and pointed out all of the new games to us. At the end of the little tour, we were next to this Typhoon game – which isn’t really a game at all. I watched Jake and T go on a “ride” – you choose a course to run through and the seat rocks and moves as you go through a high speed race scene. There’s wind blown at you, too, to simulate the whole experience. I did a couple of the tracks and it was pretty fun! You just hold onto the side and enjoy a roller coaster-like ride for a few minutes. I didn’t actually play this, but I loved how it looked. Giant Connect 4, baby! Probably one of the funnest of the new games is this four player air hockey game. The four of us played – you get two pucks that are going on together as you try to shoot into everyone else’s goal. There are lights in the middle indicating how many “lives” you have left. All of us got our fingers smashed at least once while playing, either trying to dodge a puck or trying to smack it across the table. A lot of fun, though! Dave & Buster’s have 10 new games in their stores this summer. They’re letting you play three for free (with same day Power Card purchase or reload). From now until July 29, 2012, get two free plays on three new games: Dirty Drivin’, Speed of Light and QuadAir Hockey. New games are marked with signage next to them so you can check out all of the fun new games! All in all we had a total blast visiting Dave & Buster’s for a night out. With some new, good entrees in the lineup and plenty of games on hand it’s definitely a fun time for dates, friends and families alike. Disclaimer: I was invited to dine here on behalf of the restaurant. Our meal and our gaming cards were complimentary. I was not paid for this review and all opinions are my own. Wow, that’s a lot of food! I’m glad to see your dessert stomach was able to kick in, though. Those pretzel dogs sound good… I’m a sucker for a good pretzel. 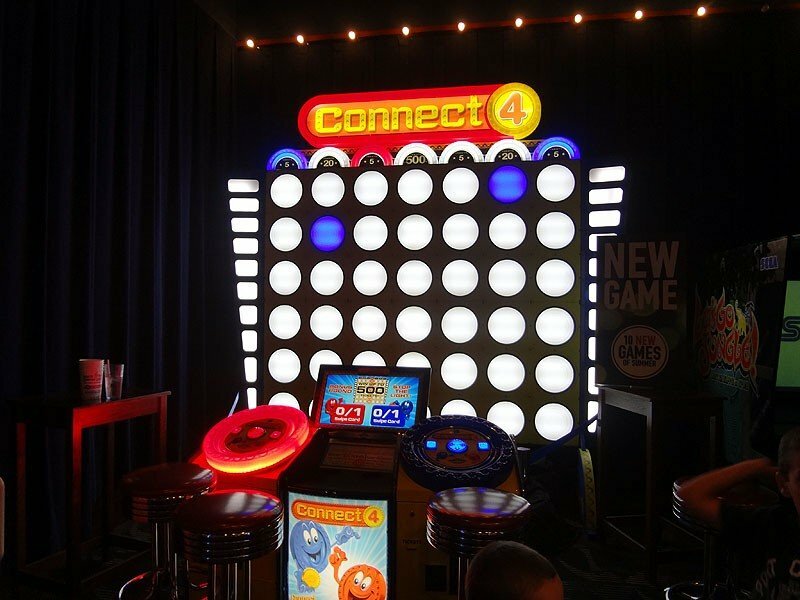 I’m kind of in awe of the huge electronic Connect 4 game. I would totally play it! Dessert stomach usually kicks in! I didn’t eat much dessert, but I knew I had to try some of it. I didn’t play the Connect 4 game because there was usually someone sitting at it when I went by and it seemed silly to play it by myself… I kept losing track of all of the boys so I didn’t get around to it. WOW makes me want to come to San Diego! I think there may be a Dave and Buster’s here in Mass, though! Food looks amazing!!! You don’t happen to know the recipe for the Jameson Shake, do you? I tried to make them at home and failed, would love to know how D&B does it. Hi Anna – Sorry, I don’t know it! 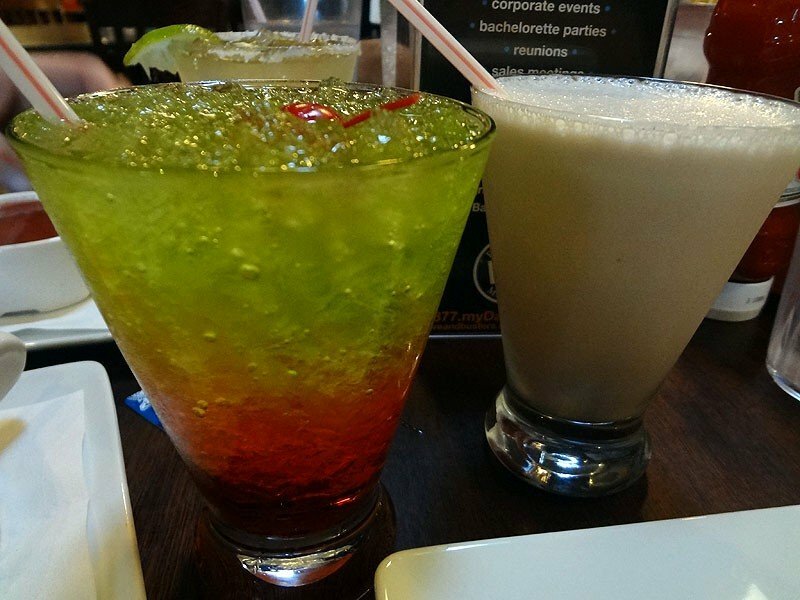 I saw this Irish Milkshake drink: http://madtini.com/the-irish-milkshake/ – I don’t know if it would be similar or not. It’s been awhile since I had that shake!